In "Heirloom," a somber man intercepts his son -- clearly bound for some far-off initiation to adulthood (uni? The military? The jungle?) -- to pass him something that's been in the family for generations. Check out the molar marks on that ancient piece of Stride ("the ridiculously long-lasting gum")! Heirlooms don't get more intimate than that. We confess to being surprised by this video, one component of a campaign called "I See" for the Museum of Modern Art (MoMA). In it, a bored museum-goer holds an audio guide to his ear and listens while it describes an abstract installation in a way that, while mundane, still struck us as strangely magnetic. Without any audible change in tone, the audio guide suddenly ties the humiliation of the artist, who debuted his work in 1913, to a recent experience its listener suffered at the office. The voice, markedly female, remains sympathetic but professionally pitch-perfect, as if nothing out of the ordinary is happening. Cheater Video is Actually Boat Promotion. Who Knew? "Cheaters" depicts a guy destroying the car and motor home of his cheating wife's beau -- using a boat suspended from a crane. And in the event you wonder why, just wait for them to talk. Then you'll go "...ohhhh" -- and maybe, if you're like us, you'll have a weird inexplicable desire to watch Deliverance. 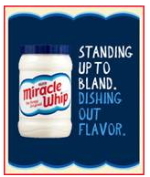 Miracle Whip Brings the, Uh, Zing. Blessed with the hefty task of building Miracle Whip awareness among the remaining 18-34-year-olds that don't have debilitating eating disorders, yesterday AKQA launched "Bring the Zing," a digital campaign that weds the white stuff to online activity. "Zingers" is an archaic word for "witty comebacks," given new life for the malevolent purposes of the digital generation. At the Miracle Whip website, a wee app called Zingr Beta lets you leave comments all over the 'net via Facebook Connect. Naturally, each Zingr you sprinkle appears on your Facebook Newsfeed. Give it a whirl and let us know what you think. As demonstrated by this post, we're clinically incapable of being witty this early in the morning. - Stop soot (by Underground Advertising of San Francisco). - Big reveal on YouTube HD Camera Trick (kinda neat if you're an optical illusions kinda chap, plus lots of YouTube users got called out). The original video was an effort for Samsung. - Create your own ville courtesy of Johnsonville, the creators of their own ... sausage. - When to delete a nasty blog comment. 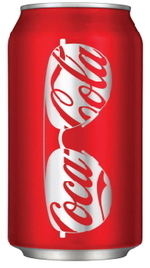 - Who'd've guessed: "you guys shoulndt even put something about the barbies... they are NOT earth friendly.."
Coca-Cola kicks off barbeque season with a set of fresh and festive Coke cans. Each is red with the silver silhouette of something summery -- sunglasses, a grill, a beach ball -- and the logo, either peeking out of the image or interacting with it some other way. The one at left looks kind of like Diet Coke masquerading as Coca-Cola Classic. (We'll leave you to make the aspartame-laced-wolf-in-sheep's-clothing jokes.) But this is infinitely less gauche than the limited-edition Ramadan cans.